I lost a friend who I could count on. I lost her because I backstabbed her. I never mean to hurt people, but I do. I have so much pressure to be perfect on the internet that I lost track of what really counts. This makes me ashamed of who I really am. I may be loyal on the outside, but I seem cold on the inside. I joined a roleplay site over a year ago, thinking I would be never wanted around. I had a bad rap, but I was severely opened with welcoming hugs and I appreciated it. I grew into my 16th and 17th birthday with this site. I matured with them and developed a love for this pack. My loyalty grew so strong, I lost sight of everything in my life. Everything has been going downhill over the last few months. Over my ruthless actions, I lost so much. Seeing what I have done makes me disgusted. I have been wanting to kill myself over th elast week because of my ruthless actions I called upon to others. I shouldn't be lile this, but more like Jay. Be timid but modest. I am in no way of being called modest. Don't call me a friend, because I am not. I am worthless. Why should I even be called human? I love roleplaying and I love that pack. I loved all my friends but I lost them to how stupid I am and how blinded I was to the real world. I need to grow up and act 17, but how can I? In this world, I must achieve my destiny. But, my stubbornness is keeping me from becoming someone, something in this world. I am soo sorry SRP. I am sorry, Amberheart, but I am sorry Fallenstar. I don't deserve you, and I don't deserve to be hurting people. I was blinded by revenge. I regret even living. I have hurt so many people, I cry every night, ashamed. I don't know how to fix anything. I want to fix this. Make this right. But, I apparently can't fix things. I can't make them right. I can't retake my position in SRP ever again, nor can I claim this position here. If you wish to remove this administration tag, go ahead. I am ashamed of myself for the things I have done. From this moment forward, I am trying to change. But, it won't matter to you. It will matter to my pack. So, farewell to all. I will sincerely be missing you everyday. so you're just giving up then? 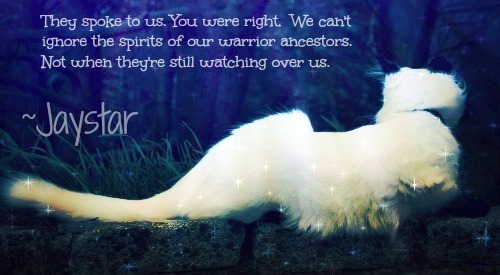 Jaystar, from the short time i have known you on here, i can tell that on the inside you are a wonderful person. I love to rp with you, and everyone on here. (even though i'm a newb. XD ) don't you ever look behind you- because we all do horrible, stupid things that we regret every day. But we can't fix them, the future is all we have- so please don't be dragged into the past by stupid mistakes, i have made millions, trillions of horrible mistakes, and i have lost so many people in my life that were very important to me. I try my best every day to be chipper, and smile, and try to walk across the glass to get to the field full of soft light and welcoming smiles..
i feel like an outcast wherever i go- and somehow i think its safe for it to be like that. so i don't hurt anyone. But im trying, and you need to try to, please don't give up. im here for you- everyones here for you! don't look back on the past, because the past doesn't matter now- the future is where we can learn from our mistakes, and heal broken hearts.